Letter from BW to Mr. Minoru Tsutsui RE: in response to his letter of request, BW sends him sample copies of examination questions in organic chemistry. [Letter from Mr. Tsutsui to LP March 25, 1953] [Filed under LP Correspondence: Box #410, Folder #18]. Letter from Hymin Shapiro of the Ethyl Corporation to LP RE: sends a gram of the compound bis-cyclopentadienyl iron as LP mentioned that Dr. Shomaker might be interested in making an electron diffraction check of it. If LP would like a liquid derivative of this compound, let him know. [letter of response from LP to Dr. Hymin Shapiro June 22, 1953] [Filed under LP Correspondence: Box #313, Folder #1]. I received your letter, to Harry Weaver, this morning, and immediately telephoned him. He had not seen your letter yet, but after I told him what you had said, and what my opinion was, he said that he would bring Watson over for the Virus Symposium. He suggested that they might save money by having Watson stay here through the summer, instead of returning to England. I pointed out that the work that Watson is doing in collaboration with Crick is very important, and that it might well be important enough to justify sending him back to Cambridge, even for the period of two months. I judge that he agreed to do that, if necessary. their structure. While there is still a chance that their stricture is wrong, I think that it is highly probable that it is right. It has very important implications, as you mention. It think that it is the most significant step forward that has been taken for a long time. Letter from LP to Prof. Theodore T. Puck RE: in response to his letter of request LP writes that he is unable to stop over in Denver to present a seminar on his way home to Pasadena from the Academy meeting because he will also be giving some lectures in Buffalo. 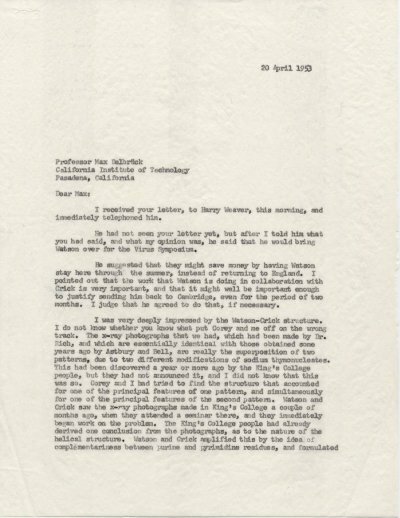 [Letter from Prof. Puck to LP April 14, 1953].